Okay so you know you are going to need work out gear – and Zumba Head Office send you a really helpful packing list, and plenty more people will give you tips, but here is my quick note on what to pack and what not to bother with. Spare insoles – even if they are for giving to others. Water bottles – water is available in all sessions and at water fountains in the OCC – fill up for sessions and avoid creating more plastic rubbish and paying for $5 water. 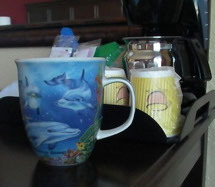 Mug – most hotels have paper cups and each one is wrapped in plastic. To avoid creating more garbage (you see how I used the American?) why not pack a mug or pick up one in a hotel gift shop – also makes a nice souvenir. Washing liquid – SOAK is amazing stuff. It's so gentle you don't have to rinse and it worked wonders on the oldest, sweatiest shirts I took with me so I could throw them away at the end of convention. Travel washing line – this would have been useful as I had to do so much laundry. You just cannot leave your sweaty kit until you get home and, as for the in-house laundry costs, well, it's cheaper to buy new kit. Tea bags – I was disappointed with the local offering. Photo business cards – no one will remember who you are unless you have a photo, as you meet so many people. Sun tan lotion – get your favourite brand, you'll need it for the pool party. Swimwear – even if it's for a five minute dip. UV 50 rash vest – great for throwing on when you want to take your skin out of the sun but want to stay in the pool. Waterproof watch – essential for staying on top of time whilst in the pool and hot tub – doesn't have to be a dive watch, mine was a £15 kids watch which glows in the dark – when it stopped glowing in the dark I realised I hadn't been outside enough and it had no UV "charge" – also useful to keep your vitamin D topped up! Vitamins and other supplements – useful stuff when you're running yourself ragged. Energy bars – just in case. Cool bag – leaving stuff in the fridge is easier and better as it can last a couple of days. Wheelie bag – (unless you are planning on lugging a cool bag around with you). Sweatshirts – you may need one or two, but even with full on air conditioning most events are fine with just a vest top (especially if you change into a dry vest or T-shirt as soon as you finish each master class).